Low prices. OrangeSmile.com offers car hire service in Greece on the lowest-rate-guarantee basis, since we work with car suppliers directly. For your search criteria in Greece, we always select and show the best rental offers. The car reservation process consists of 3 simple steps: (1) search for available cars for your dates in Greece; (2) select your car type; and (3) fill in the booking forms. Once the reservation is completed, you will receive a confirmation voucher to your email address. During the booking process, please check your rental conditions. To pick up your car at the rental point in Greece, you need to provide our confirmation voucher, your driving license and a valid credit card. The final payment is normally carried out at the pick-up point. Our car hire points in Greece accept VISA, MasterCard, etc - please check your rental conditions. At the pick-up point, please read the handling manual and check the car for present defects. OrangeSmile.com wishes you a pleasant journey to Greece! The car hire reservation system OrangeSmile.com allows renting a vehicle in Greece within 10 minutes. Our largest database of car suppliers enables us to provide you a rental car in Greece at the cheapest rate ever possible. At rental locations in Greece we offer the following car sizes: mini, compact, economy, standard, premium and luxury. The following car types are available in Greece: Sedan, Hatchback, Jeep, Cabriolet, Coupe, Minivan and Minibus. 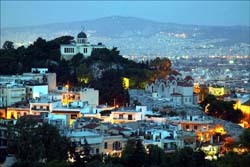 Athens is known as the most famous tourist destination in Greece. The city is included in the list of the oldest settlements in the world. It’s a true treasury of historic and archaeological landmarks. Tenths of thousands of tourists come to Athens to see Mount Lycabettus and the Acropolis of Athens as this is where first settlers appeared on the territory of modern Athens 6 thousand years ago. The city was formed around these two landmarks. Aphrodite Temple, better known under the name Parthenon, is considered the main historic landmark of Athens. The building has a miraculous construction from an archaeological point of view. Built in the 5th century BC, Parthenon consists of numerous columns and looks very light weighted at a glance. There is another important landmark nearby – the Erechtheion that was constructed in the 5th century. Many centuries ago a beautiful palace stood on the site of the ancient temple. According to a legend, the dispute between Poseidon and Aphrodite took place at that palace. The territory around the Erechtheion is decorated with beautiful statues, the most famous of which are Caryatid sculptures. One of the statues was brought to the British Museum in order to keep it in safety. Many tourist destinations are located in the territory of Attica – the capital region of the country. The most famous landmarks of the region include Delphi and the Apollo Temple, the Oracle and the Sybil Stone. The city of Piraeus is famous for its magnificent nature and rich choice of cultural places of interest. The most famous tourist destinations are open air theatre on a hill, Navy Museum, the Museum of Archaeology and several local villages. The most famous and interesting villages of the region are Glyfada, Vouliagmeni, Mati and Daphni. Kaisariani village is famous for its ancient monasteries located in the piedmont region. Peloponnese Peninsula is an important tourist object of Greece. There are many legends connected with the peninsula. Most of them are about the ancient city of Corinth and its grandiose temples and acropolis. The temples of Athena and Apollo have survived in best condition. Both the temples were constructed in the 6th century BC. Macedonia is another popular tourist destination. This part of Greece is not only rich in historic landmarks, but is also very beautiful. Spectacular waterfalls, ruins of ancient settlements, odea and oases – you will see all these and even more in Macedonia. Crete Island is simply adored by travellers as this is a wonderful place with rich history. The most famous sights of the island include Minotaur Labyrinth, Minos Palace and around a hundred of other ancient monuments that tell more about Greek gods and heroes. Every city and region in Greece can strike visitors with their rich heritage and share many interesting stories about past centuries. All car rental offices in Greece require a credit card with the name of the main driver on it. Credit cards of friends and relatives cannot be accepted even if they are present personally. If you notice that the invoice differs from the amount indicated in the voucher, and the staff refuses to correct the documents - please call us using the phone number indicated in your voucher.